ArmRx® are patented, easy to adjust, innovative, lightweight, non-sterile, double sealed, clear polyethylene arm and leg sleeves that provide totally effective and watertight protection. Each glove is available in one universal size that is easily adjustable to the personal requirements of an individual use regardless of their height, body weight or respective lengths of their arms. Each individual glove can be fitted on to either the right or left limb. 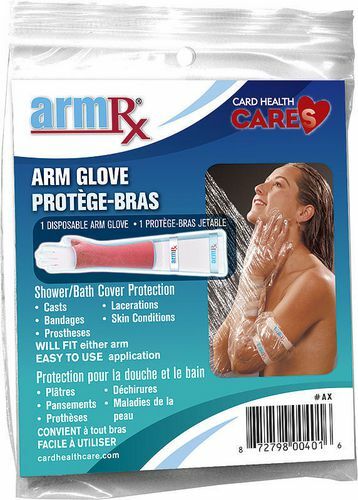 ArmRx® helps patients stay dry and can be used to cover casts, surgical dressings, bandaged wounds, prosthesis, IV sites, PICC lines, skin conditions and lacerations. Ideal for the shower, bath or pool without jeopardizing the healing process. Get back in the water with ArmRx®.